A candlestick is a kind of value diagram that shows the high, low, open and shutting costs of security for a particular period. It began from Japanese rice shippers and merchants to track advertising costs and day by day force many years previously getting to be promoted in the United States. The wide piece of the candle is known as the "genuine body" and tells financial specialists whether the end cost was higher or lower than the opening value (dark/red if the stock shut lower, white/green if the stock shut higher). Step1: Install sdk for graph in application by defining this dependency in app/build.gradle. Step2: Now we will be creating a layout file for the graph. Basically, layout file is assigned as a view to the activity class which will further interact with the layout component.So we will be creating an XML file named as "activity_layout_trade_graph_view" under res/layout/ directory.In this file, we will be declaring a candlestick chart view component which is a customized view group designed by chart view library developer. 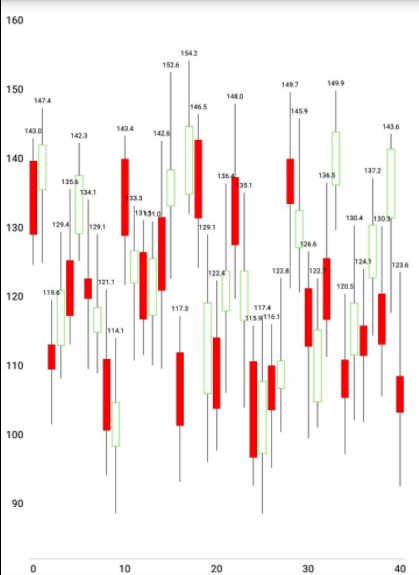 Step3: In Step6 code window there is a method updateChartData(),which is used to configure Y-vals of candle based upon server data of orders.Candle Entry is marked as per order object and Candle graph y-vals are plotted. Step4: We will be setting view of activity class by XML layout file using abstract method setContentView(). Then we are assigning initial configurations for the chart like bg colour, max visible count for columns,pinch-zoom functionality and grid background along with laying down X-axis to bottom and various animation settings. We will also update Yvals of the chart after getting data from the server and making suitable candle entry. We will set increasing and decreasing colour for each candle.